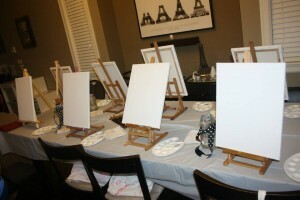 Experience Club’s Painting pARTy! 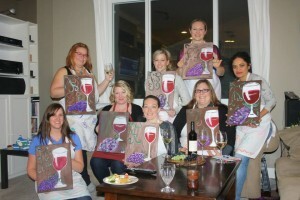 « Blog « DFC Events Inc.
Home » Blog » Experience Club’s Painting pARTy! In our last blog post, we had talked about our ‘Experience Club’, where we plan a monthly event with a group of our girlfriends. Our latest experience was a painting party with the talented Zealous Art and was catered by the fabulous Celina of Table is Set! Freda created a unique painting for our group per my request – a wine themed painting! She brought all of the painting supplies, setup the easels and canvas, and gave us step-by-step instructions on how to paint! A few of the ladies started out, out of their comfort zone – but that’s good, it’s the whole point of the Experience Club! Not everyone had experience with art and painting and a few were worried that what they were creating wasn’t exactly like what Freda had created. But that’s art! And in the end, everyone was extremely happy with their artwork and was pleasantly surprised that their painting turned out great! We had also spoiled ourselves that night by having it catered by Table is Set and we all agreed that the food was AMAZING! We had Warm Crab Dip with Gluten Free Chips, Spicy Shrimp Mango Tapas, Pecan & Cheese Tapas, Marinated Chicken & Red Pepper Tapas, and Gluten Free Chocolate Zucchini Cake in Mason Jar! To add to the art theme of the evening, we used mini art easels and canvases as food labels and artist palettes for dipping sauce. 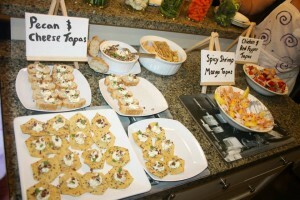 These were an inexpensive and easy way to add to food display!